The White-faced Cuckoo-dove (Turacoena manadensis) is a poorly-known Wallacean endemic with a limited distribution on Sulawesi and its satellites, including the Togian, Banggai and Sula archipelagoes. In 1900, populations from the Sula archipelago were awarded subspecies status T. manadensis sulaensis based on smaller size and minor differences in plumage; however, this distinction has not been corroborated subsequently, and T. manadensis is considered by most modern sources to be monotypic across its range. We conducted vocal analysis of the cuckoo-doves’ main song using recordings collected from across the taxon’s natural range. Descriptive information on the songs was obtained from the recordings using bioacoustic analysis software, after which several statistical methods were used to investigate differences in vocalizations among populations. We report deep bioacoustic divergences in vocal trait pattern from across the cuckoo-doves’ range, with birds from Peleng and Taliabu in the east having a different vocal trait pattern from birds from Sulawesi, Buton, and Togian in the west. These patterns agree with changes in landmass that accompanied the sea level fluctuations caused by Pleistocene glacial cycles, and indicate that eastern and western cuckoo-dove populations are at the level of different biological species. We propose that the eastern taxon be elevated to species level as T. sulaensis. Given the rampant degree of habitat destruction in its limited range, this taxonomic change will have important implications on the conservation status of T. sulaensis. Wallacea, bound by Wallace’s Line in the West and Lydekker’s Line in the East, is widely recognized as one of the world’s leading biodiversity hotspots (Mittermeier et al. 1999; Myers et al. 2000). The area has very high levels of vertebrate endemism, with about 40 % of known bird species, more than 60 % of the known mammal, amphibian, and reptile species, and 75 % of known fish species found nowhere else (Sodhi et al. 2004; Lohman et al. 2011). One of the primary mechanisms leading to the rich biodiversity of the region is its complex earth history. On the one hand, Wallacea is characterized by unusually rapid tectonic movements, making it one of the only areas on earth where the distribution of land masses has changed dramatically within the last ~5 mya (Hall 1998, 2002, 2012). On the other hand, Wallacea has endured the repeated appearance and disappearance of land bridges between some of its landmasses during the sequential ~120 m sea level changes in the last 2.5 mya (Voris 2000; Siddall et al. 2003; Caputo 2007), subjecting populations to alternating cycles of isolation and contact, and turning Wallacea into a natural laboratory for evolution and speciation. Despite this, there has been a paucity of biodiversity research conducted in the region and Wallacean biodiversity is in general poorly understood (Lohman et al. 2011). The White-faced Cuckoo-dove (Turacoena manadensis) (Quoy and Gaimard 1830) is a Wallacean endemic inhabiting Sulawesi and its satellites, including the Togian, Banggai and Sula archipelagoes. These birds are arboreal frugivores (Baptista et al. 2013) and can be found in a wide range of habitats from primary forests to degraded orchards, where they help as seed dispersers of a range of tree and plant species. They have been documented ranging up to 500 m above sea level on Taliabu and to over 900 m on Peleng (Rheindt 2010; Rheindt et al. 2010). The species was first described as Columba manadensis (Quoy and Gaimard 1830) based on a specimen from Manado, now stored at the Muséum National d’Histoire Naturelle in Paris (Voisin et al. 2005). Bonaparte then divided it off into the genus Turacoena in 1854 (Bonaparte 1854). 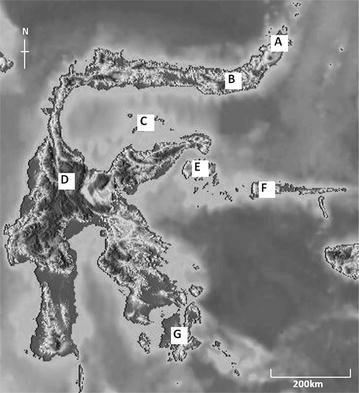 Forbes and Robinson (1900) allocated populations from the Sula archipelago subspecies status T. manadensis sulaensis based on smaller size and minor differences in plumage (Forbes and Robinson 1900). However, this distinction has not been corroborated subsequently, and T. manadensis is considered by most modern sources to be monotypic (White and Bruce 1986; Coates and Bishop 1997; de By 2002; Gibbs 2010; Clements et al. 2012; Baptista et al. 2013). We analyzed a dataset of sound recordings of the White-faced Cuckoo-dove collected by us (e.g. Rheindt 2010; Rheindt et al. 2010, 2014) and other field ornithologists, and spanning several island groups including the ranges of both the often-synonymized subspecies sulaensis as well as the nominate. Vocal analyses can be more diagnostic compared to morphology as species delimitation tools in pigeons and doves: many columbid species differ only in minute plumage details from one another but have completely different, innately-coded vocalizations, e.g. the Streptopelia radiation in Africa (de Kort and ten Cate 2001; Johnson et al. 2001; Sinclair et al. 2003), several Patagioenas species in South America (Mata et al. 2006), and several Ptilinopus members in South-east Asia (Rheindt et al. 2011). This makes vocal traits even more important in columbid taxonomy than in oscines. We report on distinct variation in the vocalizations of the White-faced Cuckoo-dove from across its geographic range in Wallacea, which provides new insights into species boundaries within this complex. The objectives of our publication are to (1) document the vocal character differences, (2) combine the differences in vocal trait pattern with Pleistocene earth-historic information to revise species limits in this taxon, and (3) explore the implications this would have on the conservation status of the taxa nestled within the complex. A total of 41 recordings containing the main contact calls of 34 individual White-faced Cuckoo-doves from across the species’ geographic range were obtained from sound archives (see Additional file 1: Appendix), from our own fieldwork (Rheindt 2010; Rheindt et al. 2010, 2014) and from other field recordists (see Additional file 1: Appendix). Of these 34 individuals, ten were from Peleng Island in the Banggai Archipelago, six from Taliabu Island in the Sula Archipelago, seven from the Togian Islands, and eleven from across Sulawesi and adjacent Buton (Fig. 1). Before analysis, we ensured all recordings were homologous, and we screened for the presence of at least one call per bird that had not been artificially truncated. Each complete cuckoo-dove call can be divided into two separate portions which we call sub-motif 1 and sub-motif 2 (henceforth SM1 and SM2, respectively). These sub-motifs are separated by an inter-motif break, and are each composed of multiple vocal elements (Fig. 2). RavenLite 1.0 (Cornell Lab of Ornithology, Ithaca, NY, USA) was used to collect descriptive information from the bird calls. A set of 16 vocal characters covering both temporal and frequency-based parameters was measured: (1) number of elements within SM1, (2) number of elements within SM2, (3) duration of SM1, (4) duration of SM2, (5) average element duration across SM1, (6) average element duration across SM2, (7) lowest frequency across SM1, (8) lowest frequency across SM2, (9) highest frequency across SM1, (10) highest frequency across SM2, (11) frequency range of SM 1, (12) frequency range of SM2, (13) dominant frequency of SM1, (14) dominant frequency of SM2, (15) first element duration of SM2, and (16) the inter-motif break duration. For all recordings containing multiple call bouts, at least three measures for the same character were taken for each individual. In situations where there were large variations in parameter measurements, additional calls (up to 8) were analysed to maximize accuracy. We generated boxplots for each of the vocal characters using R (R development core team 2008). We performed principal component analysis (PCA) on the resultant 16-character data matrix using the software XLSTAT (Addinsoft 2012). In order to prevent skewing of the results, only individuals with full call data (sample size n = 24) were used for the PCA. where x̄ i refers to the mean, SDi is the standard deviation, and t i is the value of the Student’s t-distribution under n − 1 degrees of freedom. For variables in which one population was uniformly higher than the other, we used the t-value of the 95th percentile (one-tailed test with a significance level of 5 %); for all other variables, we used the t-value of the 97.5th percentile (two-tailed test with a significance level of 5 %). We opted to use the Isler criterion as it is considerably more stringent than both the t test and Mann–Whitney U-test, due to its use of the standard deviations of the sample points and not the standard deviation of the taxon mean, which is much smaller (Isler et al. 1998; Rheindt et al. 2011). A master sheet of the measurements that were taken during the primary data collection can be found in the Additional file 1: Appendix. Due to SM1 having a shorter duration and lesser amplitude than SM2, the signal from SM1 was lost in approximately 30 % of the lesser-quality recordings. Overall, full call data (i.e. SM1 and SM2) were obtained for 24 out of the 34 individuals, comprising 70 % of the full dataset. For the remaining 10 individuals, only SM2 call data were obtained. To the human ear, birds from mainland Sulawesi, Buton, and Togian Island (henceforth called the nominate group) sound similar to each other, while birds from Peleng and Taliabu (henceforth called the satellite group) sound similar to each other but different from the nominate group (Fig. 3). The SM1 of nominate cuckoo-doves comprises a single, relatively short element (0.06 ± 0.021 s). SM2 comprises a single element that in poorer recordings can sometimes appear bisyllabic. SM2 has a longer duration than SM1 (0.41 ± 0.07 s). Overall, call duration was short at 0.8 ± 0.11 s (Additional file 1: Appendix). In contrast, the calls of satellite birds comprise more elements in both SM1 and SM2. SM1 of satellite birds comprises 3.78 ± 1.35 elements, while SM2 comprises 6.02 ± 1.83 elements. These differences in the number of elements translate directly into much longer call durations for SM1, SM2 and the full call (SM1 duration of 0.52 ± 0.16 s, SM2 duration of 1.97 ± 0.36 s, full call duration of 2.57 ± 0.39 s; see Additional file 1: Appendix). Boxplots of means and standard deviations suggest that five parameters differ substantially between the nominate and satellite groups while the remaining eleven parameters do not (Fig. 4; uninformative data not shown). Within the groups (i.e. Sulawesi-Togian and Peleng-Taliabu), no discernible differences were identified. Principal component analysis supports this distinction, with the PCA plot showing White-faced Cuckoo-dove populations clustering in two separate spatial agglomerations consisting of the satellite birds in a single cluster and nominate birds in a separate cluster (Fig. 5). Principal components 1 and 2 (PC1 and PC2) accounted for 64.57 % of observed variability in the full dataset, with the remaining principal components being much less informative and each accounting for less than 12 % of variation. Between the satellite and nominate groups, Isler criterion analysis indicated diagnosability in five out of the 12 vocal characters (Table 1): the same five parameters shown by the boxplots to be key in distinguishing between satellite and nominate groups (Fig. 4). No diagnosable differences were found when Isler criterion analyses were carried out within these groups. We provide documentation of the call of the White-faced Cuckoo-dove from different localities across its natural range in Wallacea: Togian island, Buton island, Sulawesi, Peleng in the Banggai archipelago, and Taliabu in the Sula archipelago (Fig. 1). Two vocal types exist, with deep bioacoustic differentiation separating the nominate populations of Sulawesi/Buton and Togian from satellite populations inhabiting the Banggai and Sula archipelagoes to the east. The five vocal characters which showed diagnosability are all temporal in nature: the number of elements in SM1, total duration of SM1, number of elements in SM2, total duration of SM2, and total call duration (Fig. 4; Table 1). The remaining three temporal parameters (inter-motif duration, SM1 and SM2 average element lengths) were not informative. None of the eight frequency measures were sufficiently differentiated to be informative (data not shown). This is in agreement with earlier observations of frequency parameters being less informative than temporal parameters in several columbid genera including Turacoena, Ptilinopus, and Streptopelia (Beichle 1989; Slabbekoorn and Ten Cate 1999; Rheindt et al. 2011). This observed pattern of vocal differentiation is in agreement with the presence and absence of land bridges between Sulawesi and its satellites during Pleistocene glaciation events (Fig. 6). 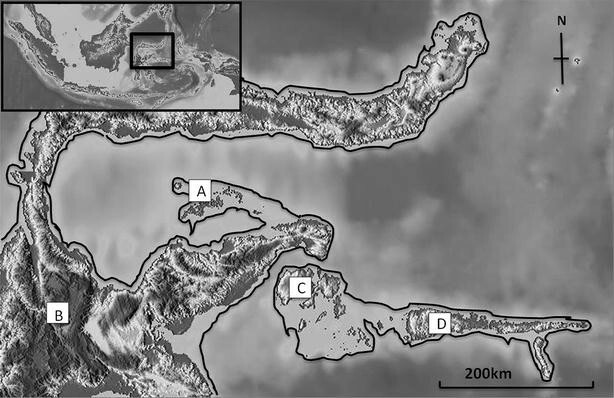 Despite Peleng being only 14 km distant from Sulawesi, the presence of a 400–700 m deep sea trench between the two has resulted in them never being connected by a land bridge even during Pleistocene glacial maxima (Becker et al. 2009). The deep vocal differentiation between cuckoo-doves from Sulawesi and Peleng suggests that this has been sufficient to prevent gene flow between the Sulawesi and Peleng populations. Conversely, the lack of divergence in vocalization within the nominate and satellite groups suggests that gene flow has occurred when land connections formed between Sulawesi, Buton and Togian (~8 and ~27 km distant) and between Peleng and Taliabu (~80 km distant). These land bridges, which have appeared in 10,000–50,000 year intervals, have resulted in sufficient gene flow to eliminate any vocal differentiation that might have occurred during interglacial periods when sea levels are high. Additionally, these findings support the idea that Wallacean forest birds such as cuckoo-doves and their relatives are weak over-water dispersers, a notion which arose when Alfred Russell Wallace noted the rarity of bird colonizations over narrow sea channels characterized by deep sea trenches (Wallace 1869). Vocal differentiation in doves and other birds often is accompanied by genetic distinctiveness as these birds have innate songs that cannot be learned during their lifetimes (Lade and Thorpe 1964; Nottebohm and Nottebohm 1971; de Kort et al. 2002; Marler and Slabbekoorn 2004). Additionally, vocal differentiation is particularly indicative of species limits within the pigeons and doves: there are many examples of unequivocally recognized, distinct species sharing little differences in plumage but exhibiting drastically different vocalizations, resulting in vocal data being routinely used in taxonomic decisions pertaining to this family (Columbidae) (Sinclair et al. 2003; Mata et al. 2006; Rheindt et al. 2011). Our findings suggest that the nominate and satellite populations of White-faced Cuckoo-dove are highly differentiated, and modern taxonomic treatment of T. manadensis as a single species across its range is inaccurate. Instead, the satellite group should be considered a separate allopatric species from the nominate T. manadensis under both the Biological Species Concept (Mayr 1963, 1996) and the Phylogenetic Species Concept (Cracraft 1983). As the satellite taxon was formerly classified as subspecies sulaensis, we propose that this taxon be upgraded to full species status. Forbes and Robinson (1900) restricted the name sulaensis to the Sula Islands, but our bioacoustic results leave no doubt that the name must also be applied to populations on the Banggai archipelago. In the future, additional genetic, morphological, and behavioural data on these taxa should be gathered, analyzed, and compared in an integrative taxonomical framework, and these two cryptic sister species further characterized. The re-drawing of biological species limits in the white-face cuckoo-dove complex has implications on the conservation status of the taxa nestled within it. The International Union for the Conservation of Nature (IUCN) allocates conservation status to species depending on several criteria including population and distribution sizes and trends. When Turacoena manadensis was last assessed in May 2012, it was given the status “Least Concern” based on several population and range distribution criteria: a stable population size exceeding 10,000 individuals, a stable geographical range exceeding 20,000 km2, and habitat that was not deemed to be excessively fragmented (BirdLife International 2012; IUCN 2012). With Turacoena sulaensis found to be sufficiently diverged to form a separate species, however, the “Least Concern” status may no longer apply to this taxon. The Banggai and Sula archipelagoes have a total land area of about 13,000 km2 (Google Earth 2014), which marks the maximum extent of this taxon, and is substantially smaller than the 20,000 km2 range requirement for a species be listed as “Least Concern”. Additionally, habitat quality on these islands has deteriorated drastically in the past few decades as a result of logging, agricultural practices, and forest fires (Rheindt 2010; Rheindt et al. 2010). While the White-faced Cuckoo-dove has been observed utilising secondary forest and abandoned orchards (Baptista et al. 2013), the latter habitats probably represent sink rather than source habitats and are unlikely to harbour the stronghold of this species. On Peleng, the lowlands are largely devoid of forests, with substantial secondary growth found only above 600 m and primary growth found only above 800 m above sea level where the species is much rarer than below (Rheindt et al. 2010). The situation on Taliabu is even more dire: lowland forest is virtually gone, high-altitude forests (above 750 m above sea level) are highly degraded, and untouched montane forest patches, even small ones, are perilously rare (Rheindt 2010). T. sulaensis thus fulfils IUCN’s criterion B1(b) for a conservation status of “Vulnerable”, as there is continuing decline of its extent of occurrence as well as its area and quality of habitat. Future studies need to be carried out to ascertain if the species experiences extreme fluctuations in extent of occurrence, area of occupancy, number of locations or subpopulations, or number of mature individuals, which constitute criterion B1(c); such studies will be able to determine if the taxon indeed qualifies as “Vulnerable”. In the interim, we propose that T. sulaensis be classified as “Near Threatened”. Using highly diagnostic vocalization data, we have demonstrated that two distinct species of White-faced Cuckoo-dove exist across its natural range in Wallacea: nominate taxon T. manadensis from Sulawesi and the Togian archipelago, and satellite taxon T. sulaensis from the Banggai and Sula archipelagoes to the east. These patterns of divergence agree with the presence and absence of land bridges between islands in the region resulting from sea level changes during Pleistocene glaciations. These changes to the taxonomic status of the White-faced Cuckoo-dove have important implications on the conservation statuses of the taxa nestled within. FER conceived and designed the research, and collected field recordings. NSRN performed the analyses, after which FER and NSRN interpreted the results. The manuscript was written by NSRN. Both authors read and approved the final manuscript. We thank all the recordists for their generous contributions, especially James A. Eaton and Rob O. Hutchinson, and the many other individuals who contributed their recordings to online sound libraries. We also thank Emilie Cros and Keren Sadanandan of the Avian Evolution Lab, NUS for their patient help and advice with the manuscript. Work for this project was funded by National University of Singapore internal Faculty of Sciences Grant WBS R-154-000-570-133 and Department of Biological Sciences grant WBS R-154-000-583-651. 40657_2015_36_MOESM1_ESM.xlsx Additional file 1: Appendix. Master data sheet. Abbreviations: AVoCet - Avian Vocalizations Center at http://avocet.zoology.msu.edu; xeno-canto - Xeno-Canto Sound Library at http://www.xeno-canto.org; McCauley - McCauley Sound Library at http://www.mccauleysound.com; IBC - Internet Bird Collection at http://www.ibc.lynxeds.com. BirdLife International. Turacoena manadensis. The IUCN Red list of threatened species version 20143. http://www.iucnredlist.org (2012). Accessed 1 Apr 2015. Clements JF, Schulenberg TS, Iliff MJ, Sullivan BL, Wood CL, Roberson D. The eBird/clements checklist of birds of the world: version 67. http://www.ebird.org (2012). Accessed 1 Apr 2015.
de By RA. The Sibley/Monroe World List of Bird names. http://www.ornitaxacom/SM/SMOrg/sibley3html (2002). Accessed 1 Apr 2015. Google Earth. Version 7111888. http://www.googlecom/earth/indexhtml (2014). Accessed 29 Dec 2015. R Development Core Team. R: a language and environment for statistical computing. Vienna: R Foundation for Statistical Computing. http://www.R-project.org (2008). Accessed 20 Feb 2015.